The rewards of witnessing students acquire their first visual views and photographic images of Venus, Jupiter and the Moon are absolutely priceless. 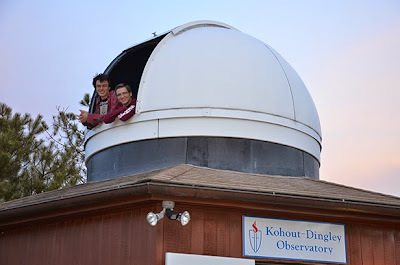 On the evening of Tuesday, April 28th, 2105, at 7:30pm EDT, 10 students from the Astronomy Club at the Sacred Heart School in Kingston, MA, gathered at the Kohout-Dingley Observatory located on the school's campus grounds. 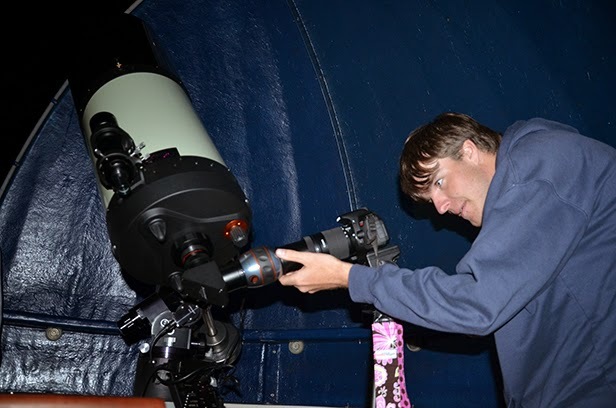 The goal for the evening was to observe and learn a little about Venus, Jupiter and the Moon through the observatory's 11" telescope with direction from staff members from Insight Observatory. Students Prepare to Observe at the Observatory. Shortly after the sun set and the observatory dome was opened up with telescope ready to go, a few students started to trickle in along with school's longtime science teacher and astronomy club advisor, Joe Masi. As twilight began, we pointed out Venus, the "Evening Star" as it began to shine bright in the western sky. 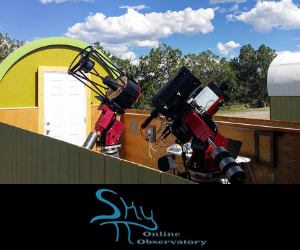 The 11" telescope was then trained on the inner planet to allow students to get a peek. Most of the observers reacted by stating, "I can see a phase... It looks like a gibbous moon like tonight’s moon phase." Sacred Heart Senior, Cam K. Photographs the Moon. After all the attending students got their first look at Venus through a telescope, we then slewed to the bright-gaseous planet, Jupiter. The seeing was fantastic as usual during and just after twilight. The North and South Equatorial Belts were very apparent. There were also four of Jupiter's moons visible in the field of view. I had every student sit comfortably in the observing chair to allow them to take their time viewing the solar systems largest planet. After they focused the telescope to best suit their view, just about every one them responded "Wow! That is so amazing! I can see the moons and belts... The belts are a reddish color". Sacred Heart Student, Cam. K. w/ his DSLR Camera. Last but not least in anyway for sure, was our last target and Grande finally for the evening... The Moon, Earth's nearest neighbor. 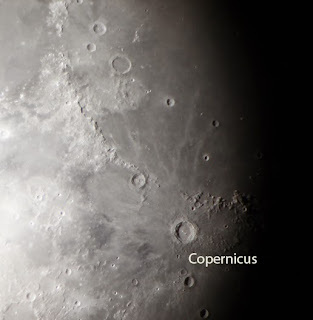 The phase was a waxing gibbous that provided an excellent view of the popular crater, Copernicus. The shadows observed within the craters and mountain ranges of the moon made the viewing that much more spectacular. One student attending, Cam K., brought his DSLR camera with him as he was there to photograph the observatory and its equipment for a school newspaper article. After viewing Jupiter and the Moon, he asked if he could try photographing the objects through the eyepiece. Cam used the method of holding the camera and zooming into the eyepiece with a telephoto lens as well as steadying the camera on a tripod. This method of astrophotography is known as "eyepiece projection". 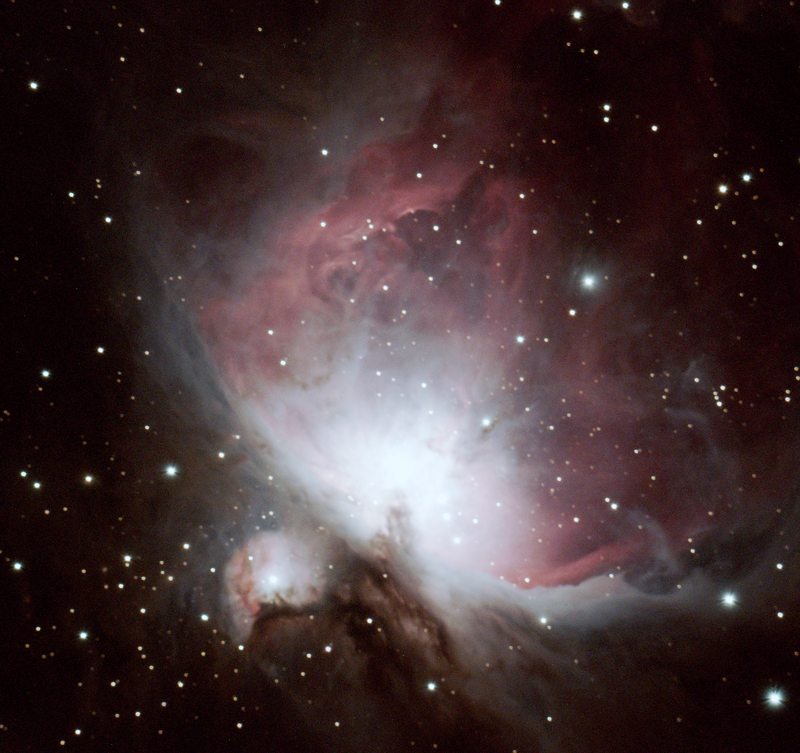 In most cases, one would get a camera adapter to fasten the camera body to the focuser of the telescope for this method. However, just as an experiment, his very first results were surprisingly good. Cam is now interested in learning more about astrophotography. While cam is an avid photographer, he made a comment while he was photographing Jupiter through the telescope..."This is the farthest object I have ever focused on and photographed."